Just letting you know that this vegan chickpea salad sandwich is sponsored by my friends at Oregon Fruit! It’s gonna be your favorite lunch! ChickPEAS chickPEAS! Where my pulse peeps at? 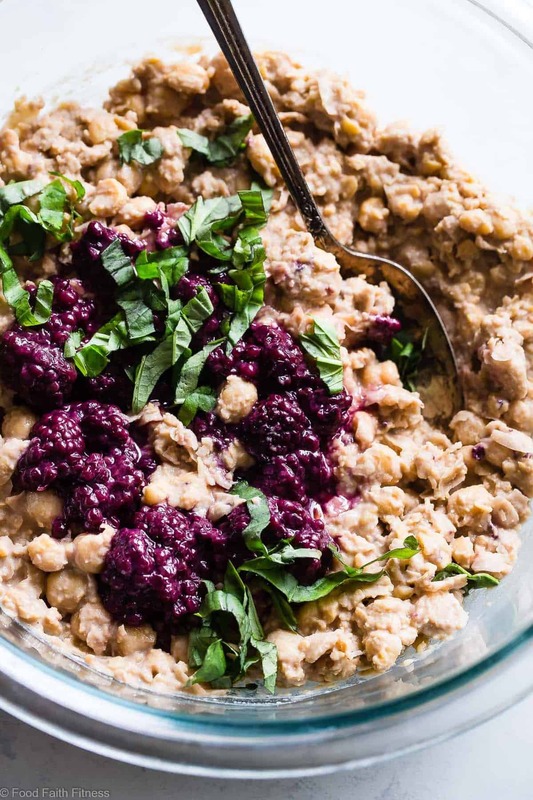 T-H-I-S smash-y mashed chickpea salad with its tangy swirls of balsamic vinegar, dreamy CREAMY yogurt, fresh basil and those mesmerizing, jewel-toned bursts of rich, PUNCHY and sweet blackberries in every bite. Whether your vessel of choice is a slice of bread (like me!) or goin’ straight at it with a spoon, this vegan chickpea salad sandwich is gonna be jazzing up your not-boring-anymore desk lunches ALL week long. We’ve all had our fair share of paleo chicken salad, Greek yogurt chicken salad or even some healthy egg salad. BUT HAVE YOU TRIED SMASHED CHICKPEAS? They’re PACKED with plant-based protein. If there’s protein in it, you can BET I am in. Fiber YO. Real talk: have you ever tried to add fiber to your diet through those sketchy fiber supplements? You know the ones were overly excited people are dancing around holding their tummies happily on TV, because said fiber is doing magical things for their digestion? Yea. They don’t taste very happy. Would MUUUCH rather get my 25-30g daily from MORE food please! Instead of being super tradish (because when do we ever eat traditional food flavors ‘round here?) I thought you might like something a little more fresh and VIBRANT. <– I know the snow is barely gone (longest winter ever, HELLO) but I think we’re READY for Spring food! 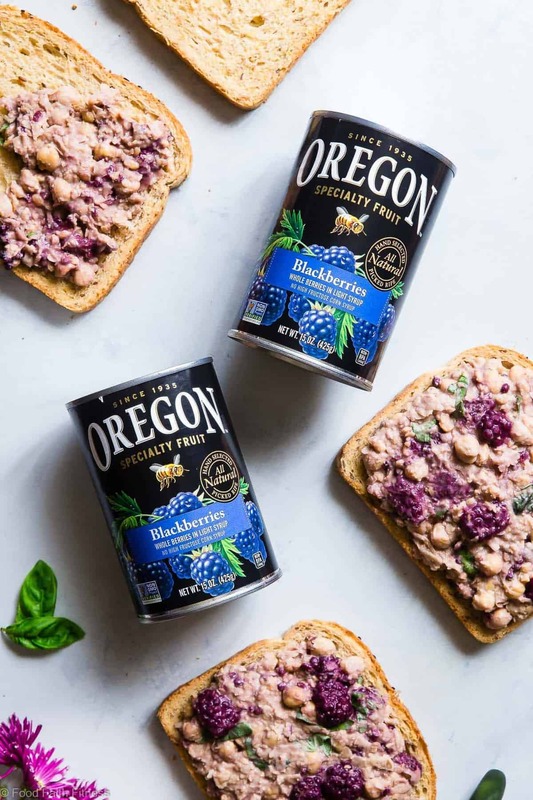 I’m paying a little homage to where I call home – the Pacific Northwest – and using Oregon Fruit’s canned blackberries to add some fruity-fresh and tangy-sweet flavor profiles to this vegan chickpea salad sandwich, that are basically kind of perfect. Oregon Fruit is an 82-year old family company that packs its berries and assorted fruit in the summer for MAXIMUM ripeness, flavor and consistency! <– You know what is going to be UP when you open any can! They’re also Non-GMO, have Z-E-R-O High Fructose Corn Syrup and a Non-BPA lining! 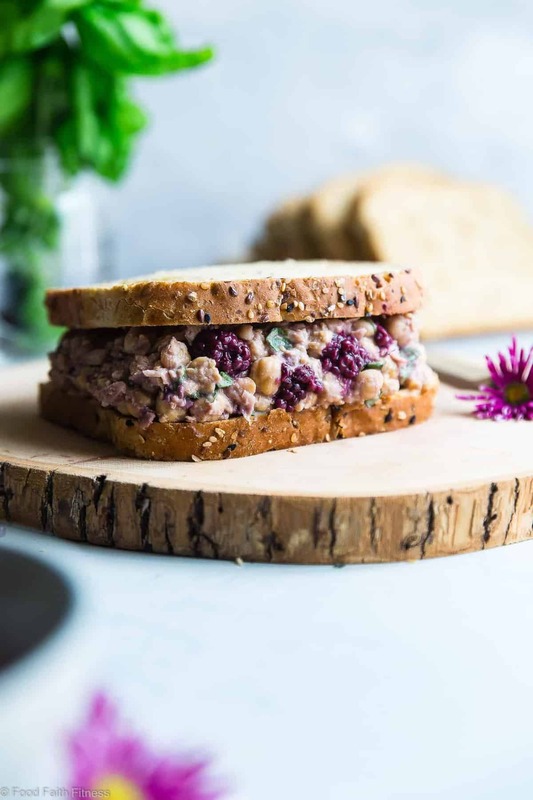 Canned blackberries are a SUPER quick and E-Z-P-Z way to add the yummy flavors and nutrients of fresh blackberries into our chickpea sandwich. Annnnd it’s the secret-trick that allows you to enjoy a THICK slice of pillowy bread piled high with some mashed chickpea salad ALL YEAR LONG. It’s the kind of lunch that you make for yourself when you don’t really have time to eat, but inner-foodie-you wants something more exciting and “adult” than the PB and J sandwich that you ate yesterday. And the day before that….and the day before that…. Not that I know anything about that. All just hypothetically speaking, of course. 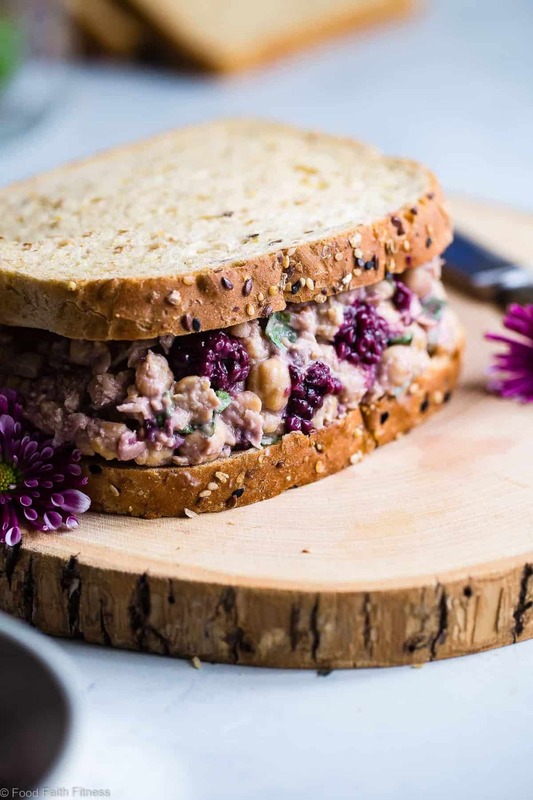 The vibrant blackberries and deep, emerald-green basil are also making this sandwich read NEXT level on the scale of your standard sandwich prettiness. I think both you and I can agree that pretty food is JUST the most fun to eat. Lunch envy. Be prepared to give it to E’RYONE around you. 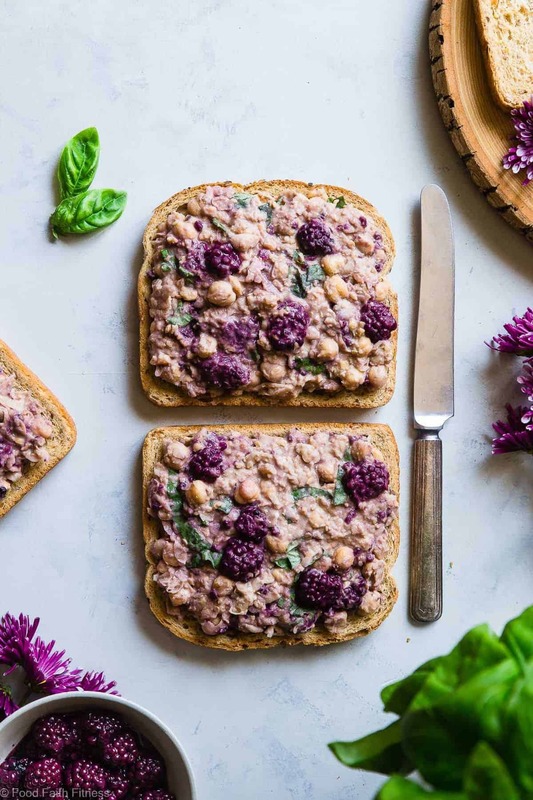 This vegan chickpea salad sandwich has tangy notes of balsamic vinegar, sweet blackberries and fresh basil! It's a healthy, gluten free lunch that's packed with plant protein and fiber! Place the chickpeas, yogurt, balsamic vinegar and salt in a large bowl and mash until most of the chickpeas are broken down, leaving some a little chunky for texture. I find using a potato mashed helps a lot! Add in the blackberries, lightly mashing them and stirring them in until well mixed. Stir in the basil. For optimum yumminess: cover and refrigerate for at least one hour to chill and develop the flavors. Spread on bread and DEVOUR! THIS POST IS SPONSORED BY MY FRIENDS AT OREGON FRUIT. THANK YOU FOR ALLOWING ME TO CONTINUE CREATING GREAT CONTENT FOR YOU BY SUPPORTING PARTNERSHIPS WITH SUPER-FAB BRANDS THAT FOOD FAITH FITNESS LOVES TO WORK WITH! AS ALWAYS, OPINIONS REMAIN 100% MY OWN! OREGON FRUIT IS BEING FAB AND GIVING 1 OF YOU A CHANCE TO WIN A $100 AMAZON GIFT CARD AND COUPONS FOR 1 FREE OREGON FRUIT CAN A MONTH FOR AN ENTIRE YEAR! ENTRY IS SUPER SIMPLE, JUST USE THE WIDGET BELOW! Yes, please! I’m a sucker for a good chickpea salad!! Oh my gosh you have to Brittany! It’s SO good! 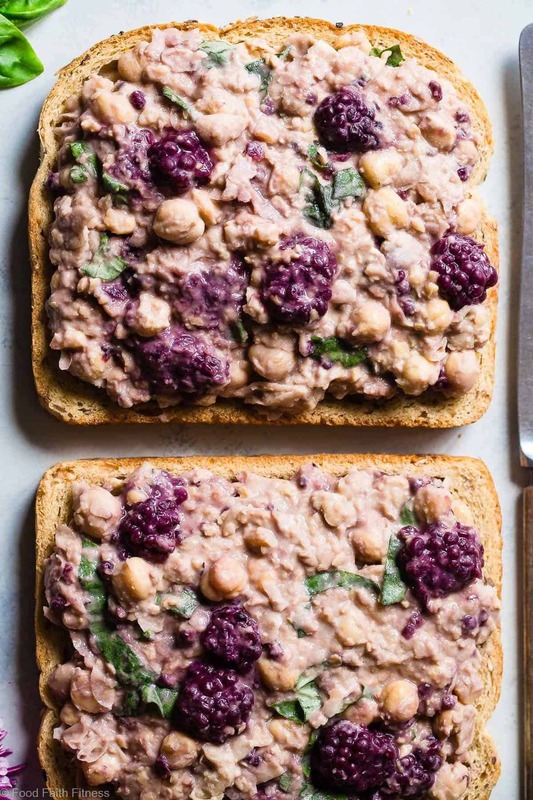 Love the addition of the sweet blackberries in this chickpea salad! Incredible flavors going on here! Sign me up! 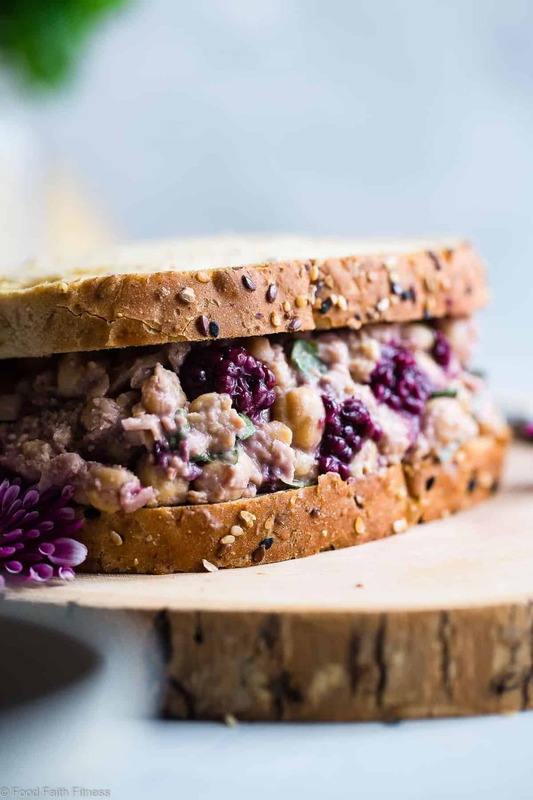 I love this idea of a chickpea sandwich for a vegetarian meal and then adding the blackberries is just perfect! This is one serious sandwich, packed with so much awesome-ness!! I didn’t even know that canned blackberries exist – I must keep this product in mind!! YES! So great for when they are out of season! Everything about this is calling my name! So much yum. 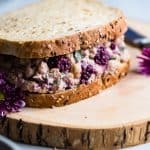 I have never tried making a vegan chickpea sandwich before, but I definitely have to try it! This would probably taste great on top of a real salad too! Oh it totally would! There are so many options! !